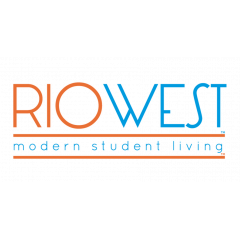 Rio West is an off-campus luxury student-friendly community located steps from The University of Texas, featuring upgrading living and enhanced community amenities. Experience the very best of off-campus luxury student living in Austin, Texas at The University of Texas - offering spacious fully-furnished two, three and four-bedroom apartments with all the amenities you need to create your unique college experience. Our apartments include – individually keyed bedrooms, modern appliances, fully-furnished living areas, flat screen HDTV, washer and dryer, dishwasher and microwave and granite countertops. Our community amenities are as amazing as our apartment amenities – including private parking garage, after-hours courtesy officer, onsite management and maintenance, free virtual tutoring services, free wi-fi and cable, private study lounges, free coffee bar luxury clubhouse, resident life events, resort-style swimming pool (w/hammock lounges) and our 24/7 Fitness Center. Our worry-free luxury living experience within walking distance of the University of Texas, allows you to concentrate on the most important thing –being a student!